A layer of cells responsible for the secondary growth of perennial plants. 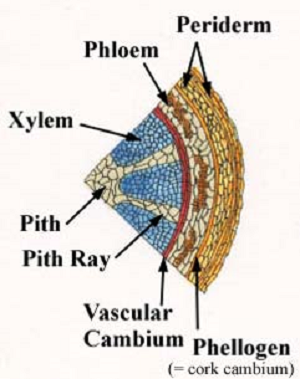 Each year the vascular cambium causes plants to grow an inner layer of cells called xylem and an outer layer of cells called phloem. The cambium can also form in the callous tissues, which allow plants to recover after their outer surface is scarred or sliced. "Interior Structure of a Plant" by unknown is licensed under Public Domain.